What if you bought your dog a new toy or collar AND helped feed orphans at the same time? For each dog collar or dog toy purchased, WO Design provides two homecooked meals for widows and orphans in Ethiopia. This post is sponsored by WO Design. Use code thatmutt2017 for 20% off your entire order with WO Design (expires Friday March 31). Click here. 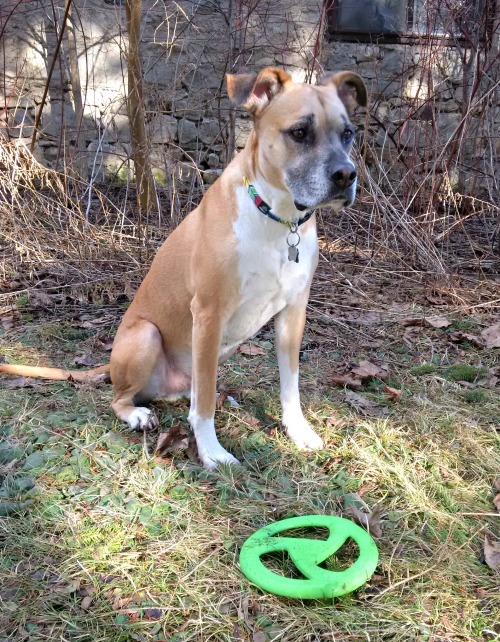 My dog Baxter got to try out a WO Design collar and the WO Design disc toy. 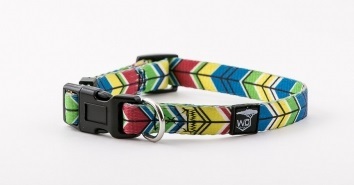 The WO|Collar is a brightly coloured, adjustable, fabric dog collar with a plastic buckle. It comes in sizes small, medium and large. The collar is brightly coloured, in blue, green, cranberry, black and yellow—the colours of the Ethiopian flag. It is made by Pride Bites. I love the bright colours on this collar. The first day Baxter was wearing it, we went hiking at a local park and a woman remarked right away on his beautiful collar. I will say that we are using this more as a fashion collar than a functional one. I’m a bit hesitant about the strength of the plastic buckle, so we’re sticking with our regular martingale collar for our walks and tie out. 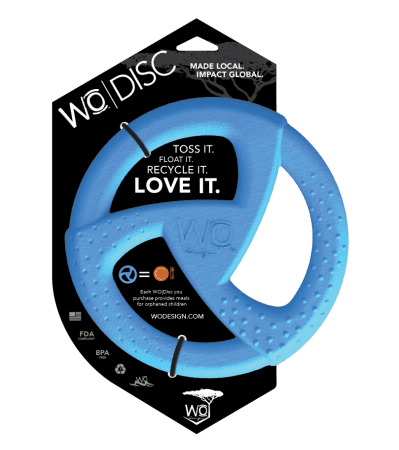 The WO|Disc is a throw and tug toy. It is soft, flexible and light rubber—and completely recyclable. It is 8 inches in diameter and comes in four colours: blue, green, cranberry or yellow. The disc is a fun variation on our usual sticks and rope. It doesn’t sail quite as far as a Frisbee, but it’s light and easy to throw. I like that the soft rubber is gentle for Baxter’s mouth. What is the cost of WO|Collar and WO|Disc? Use code thatmutt2017 for 20% off your order from WO Design. ORDER HERE. The WO|Collar costs $19.99, and the WO|Disc is $16. For each product purchased, WO Design provides at least two homecooked meals for widows and orphans in Ethiopia. What’s unique about WO Design? The charitable aspect of WO’s business is a unique feature of their company. The company’s commitment to the cause of women and orphans in Ethiopia is obvious through their website and their packaging—and even the colours of the WO|Collar. Buying from WO Design means you’re part of helping women and orphans in Ethiopia. The WO|Collar is colourful and stylish. 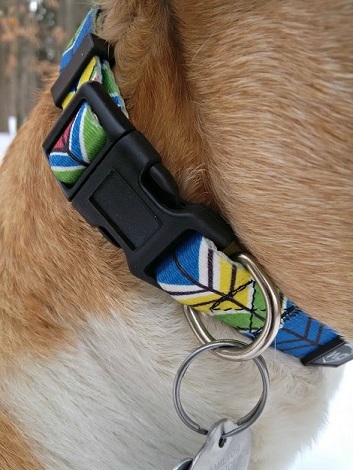 The collar can easily be adjusted to fit your dog’s neck. The spoke design of the WO|Disc makes it easy for you to throw and for your dog to carry. It’s also easy to grab. The bright colours of the WO|Disc mean it’s easy to spot if it gets left on the lawn—or tossed to the middle of the lake (it floats). I question the sturdiness of the plastic buckle on the collar. If you have a large dog who likes to pull, the WO|Collar may not be the best choice for you. The collar is fabric, which means it may absorb odors and dirt more easily. When laying flat on the ground, the WO|Disc was a bit hard for Baxter to pick up—similar to a Frisbee. Would I buy the WO|Collar or WO|Disc? I like the company’s mission, but these two products are not a fit for my particular dog. My concerns about the sturdiness of the collar mean I’ll be sticking with my martingale. As for the disc, I don’t have a high-energy, playful dog. When he does want to play, Baxter is happiest chasing a stick. Would I recommend WO Design to others? I am happy to recommend WO Design. Their mission is commendable, and buying their products is a good way to support this cause. 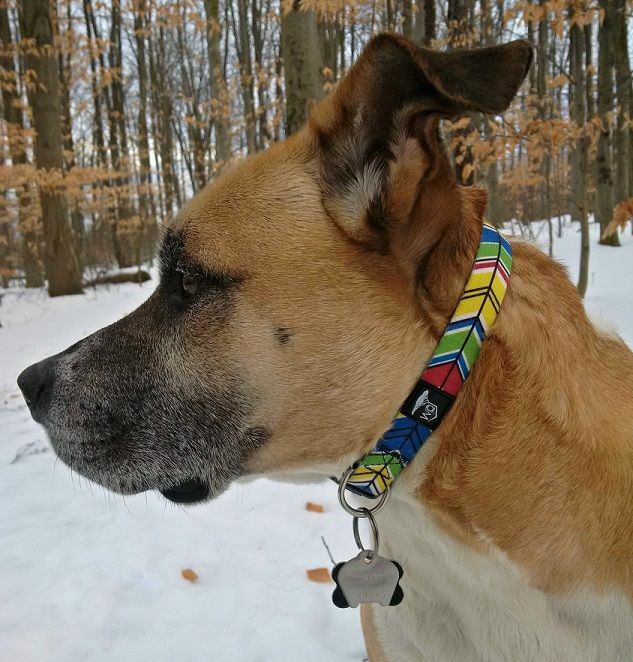 The WO|Collar would be a fit for smaller dogs or dogs that don’t pull—or if you’re looking for a colourful, stylish collar. For dogs that enjoy Frisbees, the WO|Disc could be a good alternative toy to try. 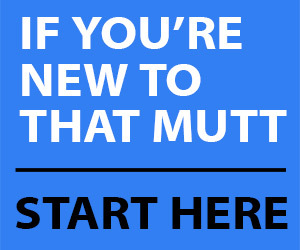 WO Design created a unique coupon code for readers of That Mutt. Use code thatmutt2017 for 20% off your order with WO Design. Click here. *Code expires Sat. March 31. Would you like a new collar or toy for your dog? Let us know if you have any questions about the products. We’ll get them answered for you!